* The amount of income generated can be controlled while assets are accumulated. Gold from production can be inventoried; it does not come into income until it is sold. Gold sales can be made when it is advantageous to do so. * All production costs and exploration expenses can be written off against income. * Royalties on gold production paid to the Canadian government are very low, approximately 40 cents per ounce of gold produced. The royalty rate is 22%, based on gold valued at $15 per ounce, the value of gold at the time of the Klondike Gold Rush in 1898. .
* Canadian laws do not restrict the export of gold. * Canadian citizenship is not required to own placer claims in the Yukon, or to mine them. * Placer gold mining is less capital intensive than hard rock gold mining. 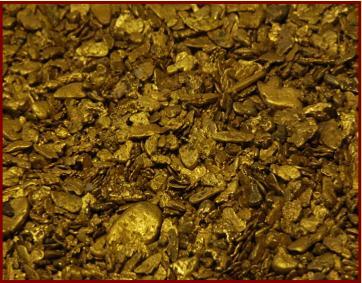 It is feasible for individuals and small companies to own a producing placer gold mine. * Placer mining can be implemented on any scale - the size of the operation can be tailored to the size of the investment funds available. Gold has been a safe store of value for thousands of years, and is considered by many to be a prudent way to hold wealth. Placer gold which is mine can be inventoried and comes into income only when it is sold.